Found throughout the temperate regions of Europe and Asia, the stinging nettle is an all-too familiar weed that thrives in the rich soil of cultivated land. The “sting” is caused by hairs on the plant that contain histamine and formic acid. Nettles are said to rob the soil of its minerals and vitamins by absorbing them and concentrating them in its leaves, so becoming highly nutritious. The herb is a nutritive spring tonic, blood builder and blood cleanser, high in chlorophyll, calcium and potassium. Use of nettle bolsters the entire body and improves resistance to allergens, including environmental pollutants, pollen and molds. The tincture of the fresh roots is a specific anti-inflammatory for treating prostatitis. The fresh herb may be used in making beer, delivering the salutary effects in a most agreeable vehicle. Pulverize or process the whole fresh plant to obtain juice. Take in 2 tsp (10ml) doses 3 times daily as a tonic for debilitated conditions and anemia. Make an infusion of 1 cup boiled water over 1-3 tsp. Drink 1 cup 3 times daily as part of a cleansing regime in arthritis, rheumatism, gout, and eczema, or use as a final hair rinse for dandruff. Use for minor cuts and scrapes, skin rashes including eczema, or haemorrhoids. Lashing arthritic joints (urtication) is an uncomfortable but traditional remedy with some recent studies showing its efficacy. Use a pad soaked in a strong infusion or diluted tincture of leaves to relieve pain in arthritis, gout, neuralgia, sprains, tendonitis, and sciatica. Take 40–80 drops (2–4ml) of the root tincture 3 times daily for allergic skin conditions and hay fever. Take 40–80 drops (2–4ml) of the root tincture 3 times daily for benign prostatic hypertrophy. The decoction of the dried herb and especially the seeds, stimulates hair growth, helps restore balding hair and improves the overall texture and tone of the hair. Use the decoction as a wash after shampooing, and leave on for at least 3 minutes before rinsing off. 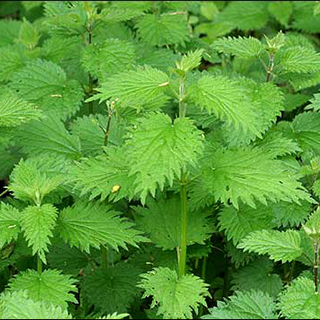 It is not usually necessary to cultivate nettles, as they grow freely in the wild. Gather aerial parts when in flower. Dig up roots in autumn, and young leaves in spring.